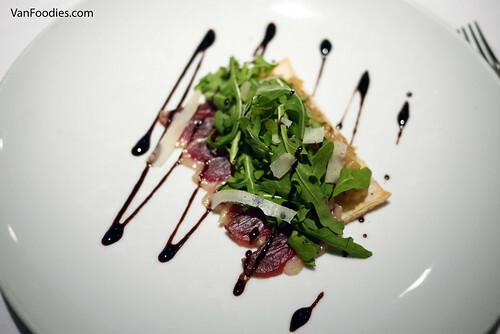 My favourite appetizer was the Duck Prosciutto Tart. The duck prosciutto was rich, salty; the puff pastry was light and crumbly. This is all tied in with the peppery arugula salad. By the way, balsamic and duck make a great pairing! 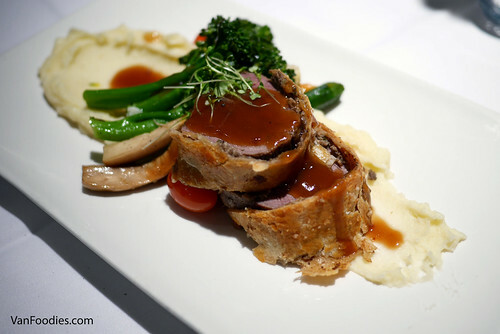 I don’t think I’ve ever had a Beef Wellington before. I sure have seen it a lot on Hell’s Kitchen and watched the chefs-in-training struggle with cooking a perfect plate. This one didn’t disappoint. The meat was tender, cooked to a perfect medium. The pastry was still flaky. You can smell the scent of truffle from miles away as it’s blended in with the mashed potatoes. I would order it again. The next entree is the vegetarian option. 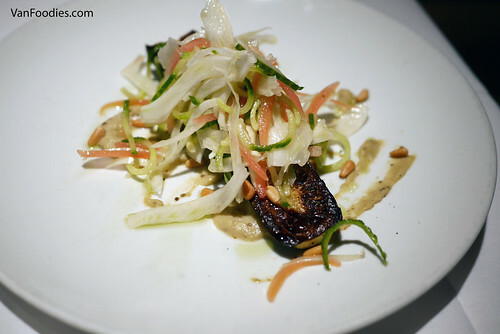 Frankly the Roasted Zucchini didn’t look appealing nor did it taste super interesting. 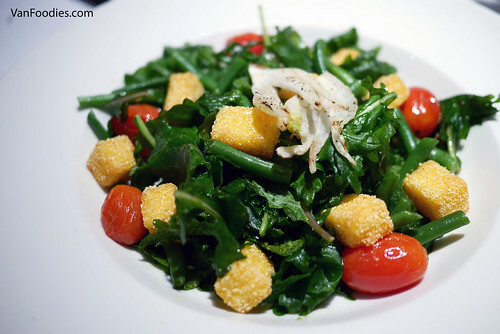 Everything tasted fresh, but to me, it’s basically a warm salad. I wish the restaurant would do something more creative for a veggie alternative. 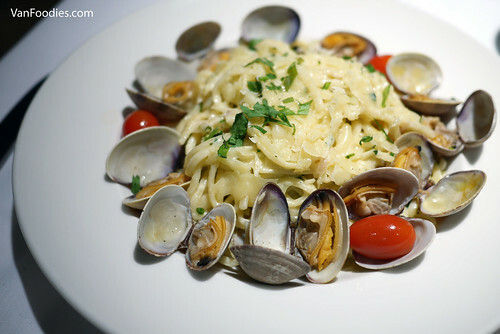 The last entree is the Linguini Vongole. This was a big portion! There was a lot of pasta and clams. Pasta was al dente, and clams were fresh and sweet. It’s not as memorable as the Beef Wellington, but it was executed well. For your sweet ending, you can choose from two desserts. I really enjoyed the tropical flavours in the Panna Cotta – passion fruit was the most prominent, with the mint and lime leaf subtly in the background. The custard was a bit too gelatinous for my liking but it was light and creamy. 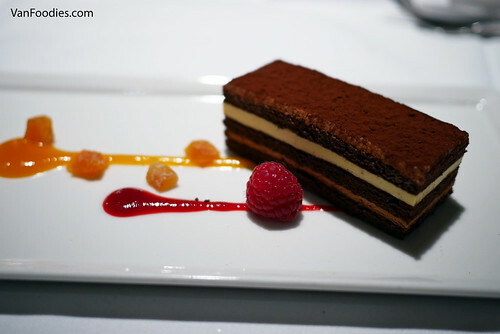 If you are a chocoholic, then you will thoroughly enjoy the Chocolate and Apricot Mousse Layer Cake. It was rich, creamy, and decadent. 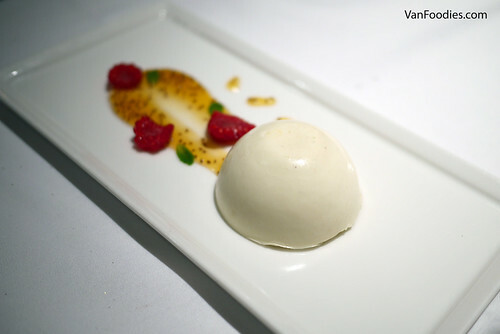 It really needed some freshness, and the apricot puree and raspberries did just that. 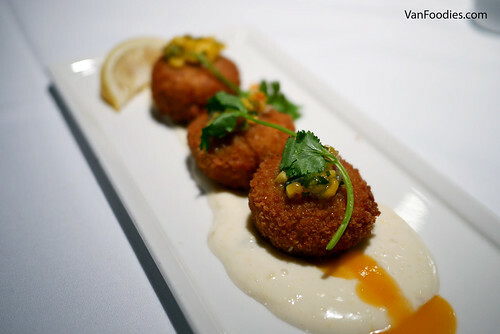 For $40, this was a solid and well thought-out menu for Dine Out. Good value for your money too. Based on the menu tasting, I would suggest ordering the Duck Prosciutto Tart + Beef Wellington + Chocolate & Apricot Mousse Layer Cake (Crab & Shrimp Cakes is a close second for appetizer). That being said, all the dishes were well prepared and I think you would be equally impressed and satisfied at the end of your meal. Disclosure: The meal was provided to me complimentary of the restaurant. However, the views and opinions expressed in this post are purely my own.